» VeganMoFo: Hairspray Don’t Eat Off The Sidewalk! Another childhood favorite, Hairspray didn’t just entertain me. It didn’t just teach me about the music, style and dances of the 60’s. It taught me about segregation and racism, more specifically, racism is for crazy assholes. I was a sheltered kid, and Penny’s mom being a paranoid lunatic in a black neighborhood in Baltimore, made little Katie scrunch up her nose and say, “Man, what’s wrong with that woman?” The Von Tussles were the bad guys, and if they supported segregation, clearly it was a bad thing. Also, they didn’t like Tracy and kept making fun of her for being fat. What a bunch of dicks! 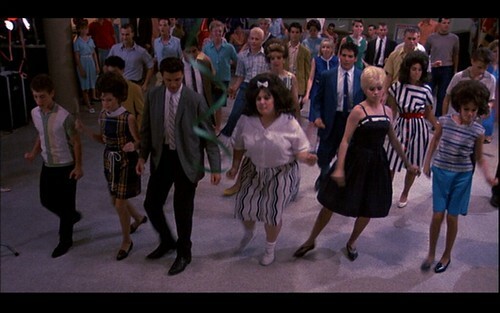 Besides the theme of overcoming social injustices, Hairspray is about dancing. All Tracy wants in life is to be on the Corny Collins show, so one night she and her friend Penny sneak off to a dance event where Tracy wins a dance contest and is invited to try out. She gets on, steals the bitchy girl’s boyfriend, becomes a spokesmodel, fights against segregation, and despite some monkey wrenches, come out on top. It would be an underdog story, but Tracy is never really presented as an underdog. The only people who diss her are, like I said, obviously assholes. John Waters managed to take the issues of segregation and racial tension and weave them into a fun storyline, but still treat them seriously. John Waters is well known for assembling awesome casts. He managed to get a whole slew of musicians in this one: Debbie Harry, Sonny Bono, Ruth Brown, Ric Ocasek, Pia Zadora, Toussaint McCall, and Colleen Fitzpatrick before she morphed in Vitamin C (yes, Amber = Put A Smile On Your Face). Ricki Lake (her talk show, VH1’s Charm School), Jerry Stiller (Seinfeld, King of Queens, fathering Ben Stiller), Mink Stole (every single other John Waters movie), and Divine round out the cast. 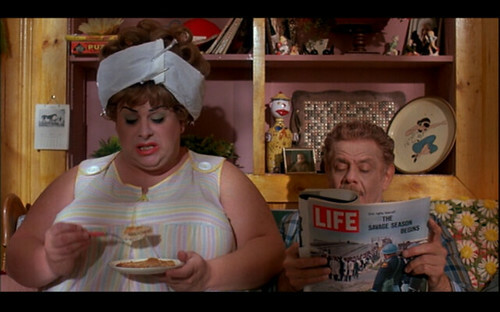 When I was a kid, I did not know that Divine was a drag queen and apparently I never paid attention to the credits of the movie or that would’ve been incredibly obvious. Entree: A hearty macaroni and (cashew) cheese, for the growing teenager in us all. Side: There are so many Corny jokes that we could make. So, so many. I decided to keep it simple with baked corn on the cob (video link). Side 2: Gimmie gravy on my mashed potatoes! Dessert: If you have room and the want to be adventurous, try your hand at making eclairs while wishing your clothing store provided pastries. And as a bonus, the opening scene complete with the title song, which will be stuck in your head all week. You’re welcome!